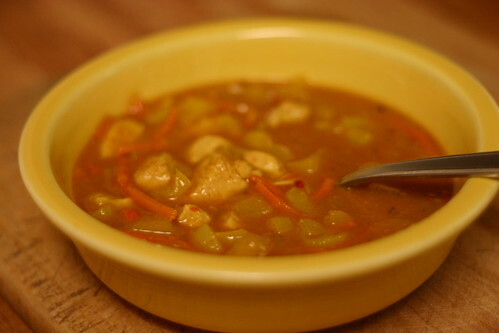 Today I cooked Spicy Mulligatawny: difficult to pronounce, but tasty to eat. I was looking for a stew, but was swept off my feet by the curry and apple in the ingredients. As it turns out, spicy mulligatawny isn’t a good meal by itself. Not enough protein. Tonight Holly grilled up some chicken sausage to go with it. We had hot dog buns, but a tasty sourdough bread would be an excellent addition. Heat 2 teaspoons of oil in a pan over medium heat. Add chicken, saute 3 minutes. Remove from pan; set aside. Heat remainder of oil (1 Tablespoon, 1 teaspoon) in pan. Add apple and next 4 ingredients and saute for five minutes. Stir in flour and next 4 ingredients and cook for 1 minute. Stir in broth, chutney, and tomato paste; bring to a boil. Calories: 242 (20% from fat); Fat: 5.4 grams; Protein: 16.6 g; Carbs: 33 g; Fiber: 3.3g; Chol: 31mg; Recipe adapted from Cooking Light. OH, one of my favorites; try this with lamb and fresh or canned coconut milk. YUM! In medium bowl toss lamb cubes with 1 Tbsp. of the curry powder and set aside. Oh, yummy! That sounds delicious. And I think you can get low-fat, low-cal coconut milk. I’ll have to try it out. I’m not much of a cook, but I’ve been trying to do one meal a week, now that we’re trying to eat more at home and eat healthier. It’s a shame that it’s so easy and inexpensive to eat unhealthy. You really have to stay on top of things. I’ll let you know how this turns out. Thanks for sharing!